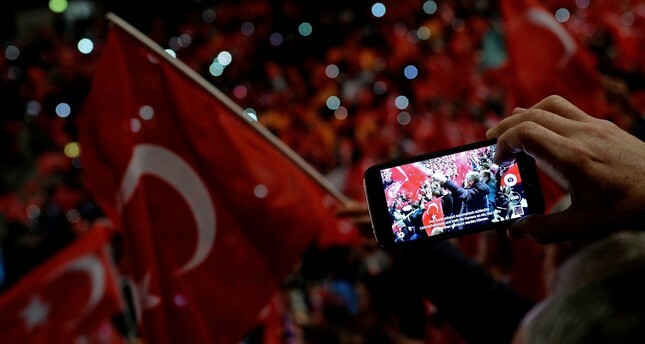 Participants taking photographs at a meeting about held by Prime Minister Binali Yılıdırım the upcoming April referendum in Oberhausen, Germany, Feb. 18. There has been a profound discussion taking place in Turkey about a transition to a presidential system for a long time. A referendum on the system change is just over a month away while the legal process will be initiated in April by the Justice and Development Party (AK Party) government with the parliamentary support of one of the three opposition parties, the Nationalist Movement Party (MHP). The proposal for the new system, which most notably will have a "presidency of the republic" in line with governmental practices, has been discussed since the beginning of the 20th century until today. Starting from the Second Constitutional era, which began in 1908, the presidential debates, which were on Said Halim Pasha's agenda, were defended by politicians such as Necmettin Erbakan, Süleyman Demirel, Alparslan Türkeş and Turgut Özal, who deeply influenced Turkish political life. But none of them had access to the political and social growth that could make this system change possible. It is obvious from the context of the recent presidential debate led by President Recep Tayyip Erdoğan, the majority of votes in the referendum will be in favor of the system change and the system will be changed enthusiastically. On Jan. 20, the second round of the constitutional amendments to the presidency's authority (in other words, the presidential regime) was completed and a referendum decision was made. Now the public will decide. The Turkish nation, which is always discreet, will use its sovereign right in the referendum, which will be held on April 16. Unless there is a big surprise, the proposed changes will be accepted. With this change, the regime of the state does not change, but the executive system will have a radical transformation. The tutelage system, which has pressured the state since its inception, will be abolished and both the legislative and the executive organs will operate in a more independent and autonomous way. Of course, Turkish politics has not reached the point we are at today easily. For decades, the presidential system has been thought about and discussed dozens of times. Often politicians, especially some of the former presidents of the republic, had their own agendas in mind when they brought up the discussions. Former presidents and many politicians in the 1970s stated that the current obstacles could only be overcome by the presidency and they even made this clear in their election manifestos. However, this situation has never been changed or been encouraged to change. For this reason, our governing system had always been blocked for political reasons. The consistently blocked parliamentary system could only be unclogged through coups. There is no need to talk about the results of the coups, or to think about them because the results are quite obvious. Constitutional arrangements designed to create a well-functioning system, which was blocked in some way, led to another hurdle of obstruction. Indeed, because of the reasons and consequences, the July 15 coup attempt perhaps was the most terrible example of this. The executive power was constantly manipulated and politically blocked. This arrangement, also known as the presidential system, will open up the executive. Thus, the dual executive system will end and the political manipulations that took place in the past will also be cut off. However, having the executive does not seem to solve these issues alone. Different sections of society are trying to create concern around the new system and the main opposition party is arguing that the system will create one-man rule, or a dictator. Redesigning the new system will seriously reduce these concerns. Of course, the change will not give rise to a totalitarian regime, as claimed by other opposition parties such as the Republican People's Party (CHP) and the Kurdish nationalist Peoples' Democratic Party (HDP), because the equilibrium system is built precisely like the main column of a building. Now it is time to cover the walls of this balanced system with a protective coating that will not allow any flow of rain or snow. How will the walls and roof of this new building be made stronger? The real question is this... The answer is to establish a new centralized structure for the new system with a series of laws and to adapt the execution to the flexibility and speed that the current age requires. The primary task to be completed after the new executive system is enacted is to seriously go over the central administration. Then the central task of the central administration is to revise the provincial system. Therefore, we have to seriously restructure the public administration. The current structure is representative of the old institutional structure and in the past it has often been the reason for significant problems. With its current structure, the Turkish public administration is seriously cumbersome, overgrown, and problematic in its organizational structure as well as it's functioning. The public administration, which has infiltrated into in every aspect of everyday life, has had trouble solving existing problems and it has also faced difficulties in fighting separatist and destructive illegal structures, especially the Gülenist Terror Group (FETÖ). We have to establish a rich central administration (in terms of staff and content) in accordance with the presidential system in order to be able to fix this. This kind of public administration needs a well-trained and efficient civil service system that attaches importance to merits. It is possible to apply the job of restructuring in a three-stage plan. First, the central administration must be restructured. If necessary, new ministries should be set up or ministries that cannot adapt to the era must be abolished. Secondly, there must be a reform of the local administrations that is effective and free from any separatist politics. For this purpose, the number of metropolitan municipalities should be increased. The third stage is, of course, the establishment of an effective and efficient public administration system that is re-structured and gives importance to merit. For as long as these arrangements are not made or delayed, the executive's past problems can occur again, stronger and more often. WHAT IF THE 'YES' CAMP WINS IN THE REFERENDUM? Well then, how will this new presidential model change the administration system and in what direction? - With the presidential system, decisions will be taken more quickly and the possibility that the government will not be formed after the election ceases. - Centralizing the state will prevent crises that are easily created in the parliamentary system. - The president, who must be elected with over 50 percent of the vote, will have appeal to every segment of society, and this will prevent disintegration as it provides social cohesion. The only way to return Turkey from the path it has entered is by breaking it down. - Turkey can play a much more effective role with the presidential system in a newly formed alliance. - Assigned bureaucrats will lose their power to rule the elected deputies and national power will manifest itself in real and absolute terms. - The link between the legislative and the executive will be broken and corruption and any kind of abuse will ultimately be prevented. - Parliament and its members will only deal with the tasks of making, removing, and changing laws. - The assigned is superior to the selected. This shows that the sovereignty does not belong to the nation, and that the national power does not manifest itself in Parliament. The national power will be reflected in Parliament with the presidential system. As a result, the presidential system will make quick decisions possible both inside and outside the country by centralizing the state, preventing parliamentary crises, fragmentation and separation and making it a strong member of a new alliance to be established internationally. The chaos based on the constitutional legitimacy of the division of decision-making into three parts (Parliament, the president and bureaucrats) will be prevented so that possible scenarios such as coalitions, early elections and weak governments will exist only on the dusty shelves of history.